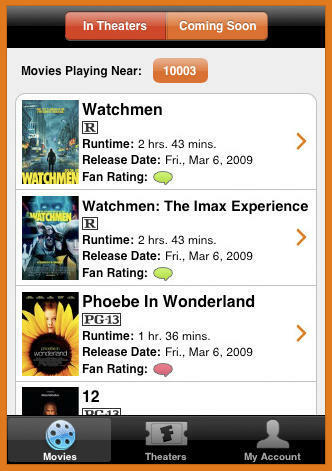 Fandango, one of the Internet’s most popular online movie information and ticket purchasing portals announced Monday a free new iPhone and iPod touch application that enables users to access movie and theater information ‘on the go’, buy tickets in seconds, watch trailers, view fan ratings and more. With a database of more than 16,000 theaters throughout the US, the Fandango app makes buying advance movie tickets easier than ever. Utilizing the iPhone’s location-aware functionality, the app automatically displays movie theater locations and times, and when users store credit card information in a secure profile, makes purchasing tickets a matter of a few touches on the iPhone or iPod’s screen. The app even has a cool little built-in feature that automatically plays movie trailers just by changing the device’s orientation from vertical to horizontal. Here is a useful little app that’s well worth the cost of admission.